Presidential candidate Mitt Romney. Photo by Richard Ellis/Getty Images. Mitt Romney stopped by an Ohio Republican Party phone bank on Tuesday to support a get-out-the-vote effort for an off-year, big ballot initiative in a couple of weeks. The support he lent appeared to be only rhetorical in nature. The former governor of Massachusetts refused to endorse a position on Issue 2, the ballot measure to affirm and enact Ohio Gov. John Kasich’s attempt to change public employee collective bargaining rights and rein in spending, and on Issue 3, which would allow voters to decide whether the state and local governments can impose an individual mandate to carry health insurance. 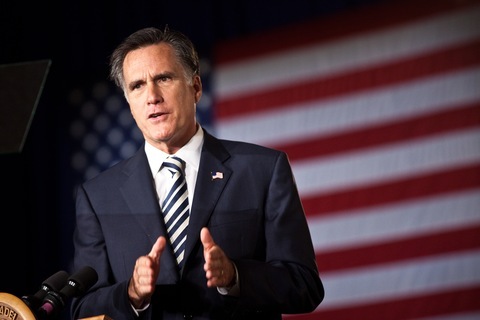 As POLITICO’s Jonathan Martin wisely noted, Romney appeared closer to an endorsement of Kasich’s position on the controversial legislation involving collective bargaining rights (SB 5) in a Facebook post in June. “I stand with John R. Kasich and Ohio’s leaders as they take on this important fight to get control of government spending. Please visit www.BetterOhio.org for more information,” Romney wrote. Despite polls that show a majority of Ohioans favor repealing SB 5, perhaps Romney was reticent about weighing in because of the health care related measure on the ballot. Whether or not a state has the right to impose an individual mandate to carry health insurance is no easy issue for Romney, as demonstrated by the constant attacks on so-called “Romneycare” from his GOP rivals. Whatever the reasoning, Romney provided yet another opening for his opponents to portray him as a politician who lacks conviction and waffles from position-to-position. “Mitt Romney’s finger-in-the-wind politics continued today when he refused to support right-to-work reforms signed by Ohio Governor John Kasich — reforms Romney supported in June. Americans are tired of politicians who change their beliefs to match public opinion polls,” said Rick Perry’s campaign communications director, Ray Sullivan. Gov. Perry certainly has his own political headaches to manage, including a new CBS/New York Times poll showing his support has plummeted to 6 percent, but he clearly sees hammering away at the age-old Mitt Romney-is-a-flip-flopping-politician-without-conviction meme as part of his path to the nomination. President Obama continues his tour of the West on Wednesday with a trip to Denver, where he will introduce a plan to help reduce student loan payments. It’s part of the ongoing go-it-alone economic measures that the president can enact on his own, bypassing Republicans in Congress. President Obama will unveil the plan at the University of Colorado’s Denver campus at 12:45 p.m. ET. The student loan proposal is aimed right at that under-30 crowd that went overwhelmingly for candidate Obama in 2008. “The White House said Obama will use his executive authority to provide student loan relief in two ways. “First, he will accelerate a measure passed by Congress that reduces the maximum repayment on student loans from 15 percent of discretionary income annually to 10 percent. The White House wants it to go into effect in 2012, instead of 2014. In addition, the White House says the remaining debt would be forgiven after 20 years, instead of 25. About 1.6 million borrowers could be affected. “Second, he will allow borrowers who have a loan from the Federal Family Education Loan Program and a direct loan from the government to consolidate them into one loan. The consolidated loan would carry an interest rate of up to a half percentage point less than before. This could affect 5.8 million more borrowers. “Education Secretary Arne Duncan told reporters on a conference call that the changes could save some borrowers hundreds of dollars a month. Last week, USA Today reported that adjusted for inflation, students are borrowing twice the amount they borrowed 10 years ago and that Americans now owe more in student loan debt than on credit cards. The measure is part of the carefully orchestrated “We Can’t Wait” initiative from the White House. It feels a lot like part of a presidential campaign because it is — but aimed at Republicans in Congress who, along with a few Democrats, have blocked President Obama’s major jobs proposals in the Senate. House Republicans won’t bring his proposals up for a vote, have flipped the “Can’t Wait” slogan around and claim their environmental and financial industry deregulation agenda would create jobs if only the Senate would pass the measures. “Majority Whip Kevin McCarthy of California, the House’s No. 3 Republican, took a shot at the president for coining a new campaign slogan and also took aim at Senate Majority Leader Harry Reid of Nevada for resisting Republican pressure to vote on the so-called ‘Forgotten Fifteen’ bills sitting in the Senate. Perry is going up with his first paid TV ad of the campaign season in the critical kickoff state of Iowa. The ad will run statewide for a week. “As president, I will create at least 2.5 million new jobs,” Perry says to the camera in his opening line to Iowa caucus-goers. It’s a positive 30-second spot that highlights his plan to jumpstart the economy and create jobs by heavily relying on new domestic energy production. Perry also points to his successful job creation record in Texas. Watch to see if Romney soon joins Perry on the Hawkeye State airwaves. That will give a sense of how robustly Team Romney may want to play in Iowa. Also be sure to be on the lookout for when the positive tone in Perry’s ads changes to a sharp contrast with Romney and others. President Obama delivers remarks on college affordability in Denver at 12:45 p.m.
Mitt Romney hosts a breakfast fundraiser with Members of Congress in Washington, D.C., at 8 a.m., then visits the Fairfax County GOP Headquarters in Virginia at 10:20 a.m.
Herman Cain addresses the Republican Women of Nueces County in Corpus Christi, Texas, at 8 p.m.